Marceline Gone Adrift #3 highlights Marceline, Finn and Princess Bubblegum as they all try to bring the Vampire Queen back. 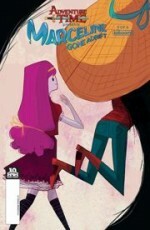 Previously in Marceline Gone Adrift #2: Princess Bubblegum starts to plan how to bring Marceline back from space! Mereditch Gran show readers three different storylines in Marceline Gone Adrift #3 that may be telegraphing some events to come. It’s a very cute issue that has many of the quirky hallmark of the Adventure Time television show that allow Gran to cleverly sidestep any need for cursing or words that could be construed as too mean spirited. The issue is rife with moments that keep it accessible and appropriate for readers of all ages while lending a truly playful reading experience for an older reading audience. The titular character of Marceline Gone Adrift #3 starts off the issue and she’s not dealing with her isolation well. She is being pursued for her music in a space bar – that’s not a bar because this is an all-ages comic – by a talent hound, just as in a mirror plot down planet side her home has been broken into by some characters looking for some hallmarks of her early career to sell. Readers also get the sense that Marceline’s temper gets the better of her in Marceline Gone Adrift #3. It’s fascinating to watch in the context of the issue because it leads her into meeting new cast of characters who are certain to play a larger part of the narrative moving forward, but it also hints at some of the personality quirks they may have driven a wedge between Marceline and Princess Bubblegum once upon a time. The past relationship between these two has been much alluded to by Gran and handled with such grace as a simple story point that I revel in every hint that is thrown our way. Further to Princess Bubblegum, she spends a lot of Marceline Gone Adrift #3 in the final stages of preparation to go after her friend and bring her back. The dichotomy of having a pretty, pink princess be so scientifically minded is so wonderfully refreshing issue after issue and when, in this issue, Princess Bubblegum takes a moment to comment orally on her own impulsiveness Gran cements this character as the most wonderfully intellectual person on the page. Princess Bubblegum launches herself into space in an act of selflessness and bravery that will hopefully be appreciated by Marceline when the ladies are represented. Not one to leave the boys out, Gran gives Finn a cool moment in Marceline Gone Adrift #3. Despite the emotional meltdown that he is undergoing in the wake of events of the previous issue, when Finn spies someone making off with Marceline’s belongings he springs into immediate action in order to protect his friend. He is foolish and overdramatic in his approach, but with the exalted ladies shooting off into space for a grand adventure, it’s nice to see Finn holding down the events taking place on their home world. Marceling Gone Adrift #3 is a sweet issue, Gran has built a lot up in these characters she’s playing with and the plot of the miniseries which ultimately makes for a very satisfying reading experience. Carey Pietsch is on art duties for Marceline Gone Adrift #3 and she continues to do an excellent job. She executes the aesthetic from the television show with great aplomb and it’s a ball to behold. 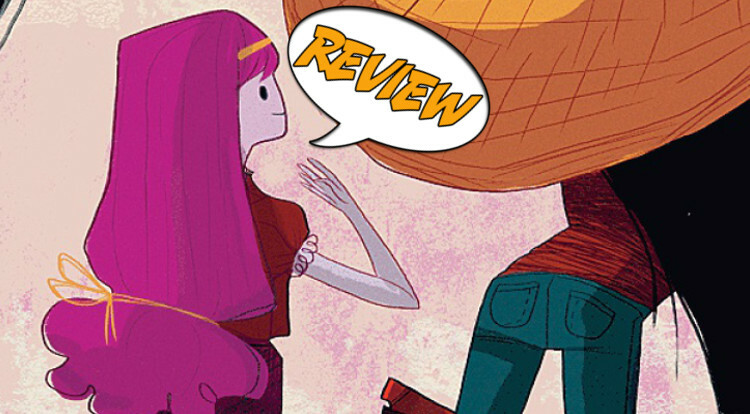 Marceline and Princess Bubblegum exude strength in different ways throughout the issue. Marceline is a ball of energy that Pietsch draws in hyper-dynamic poses that defy not only gravity and physics, but showcase the scale on which Marceline feels things and it’s very much to see it that way. For her part, Princess Bubblegum is more reserved in Marceline Gone Adrift #3 with Pietsch concentrating more on her facial expressions in order to get the mood of the scene and her deliveries across. This story is about the two of them and Pietsch illustrates their visual contrasts beautifully on the page. Of course, she tackles the variety of settings with great skill, making everything at the same time accessible and creative. Marceline Gone Adrift #3 is a fun, fun issue to look at. Marceline Gone Adrift #3 is a great issue in a great series. The story is smart, the art is sweet and it can be enjoyed by any reader. Definitely worth reading.